We followed “The Pictish Trail” around our area, checking out the Pictish Stones. These highly carved upright stones may have been grave markers, and were carved between about 200-800 AD, mostly in northern Scotland. 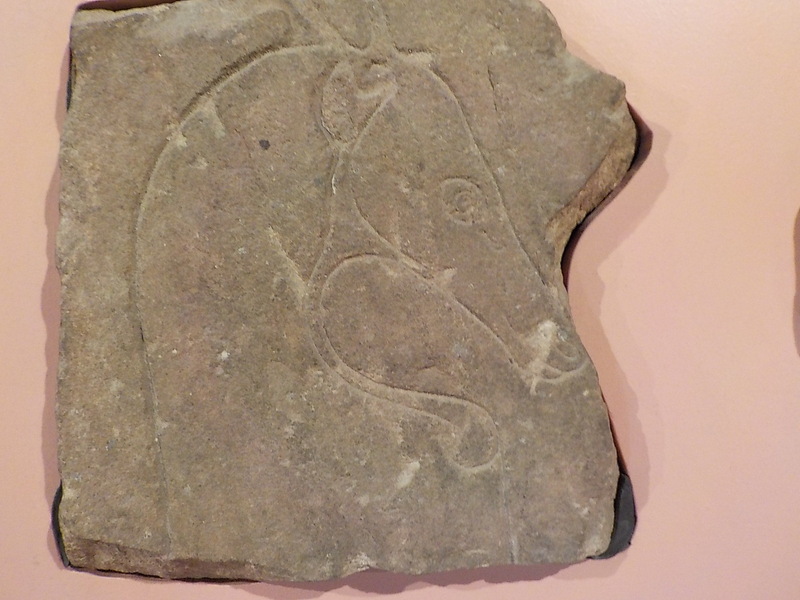 The Picts are a mysterious group, best known for these distinctive carved stones. They were early converts to Christianity, said to have been converted by St. Columba. This also explains the crosses that are usually carved on one side of these stones. Nigg Old Church stone. 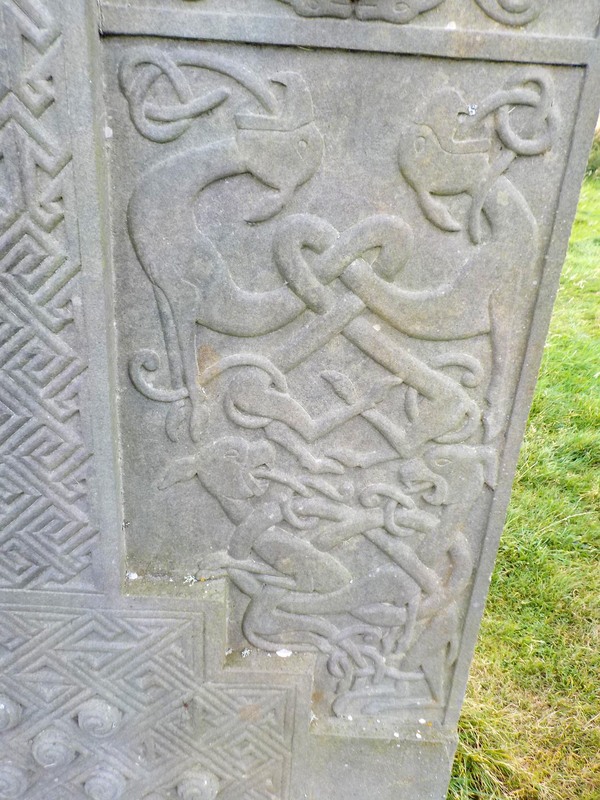 The crosses are the most elaborate of the Pictish stones. 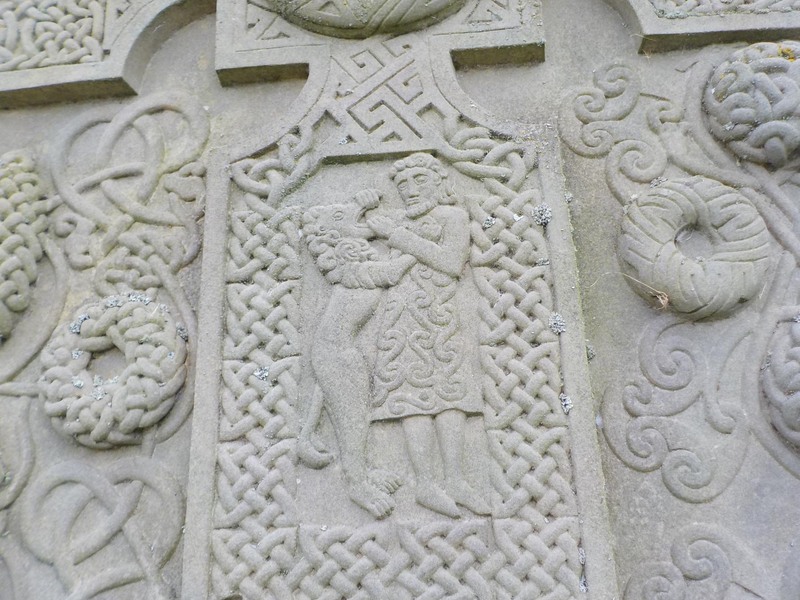 The reverse sides may have scenes from the Old Testament, such as Daniel and the Lion (right) from the Hilton of Cadboll stone. Hunting scenes are often present. If you look carefully, you see two additional horsemen below the horse and rider in relief on the Edderton Churchyard stone. 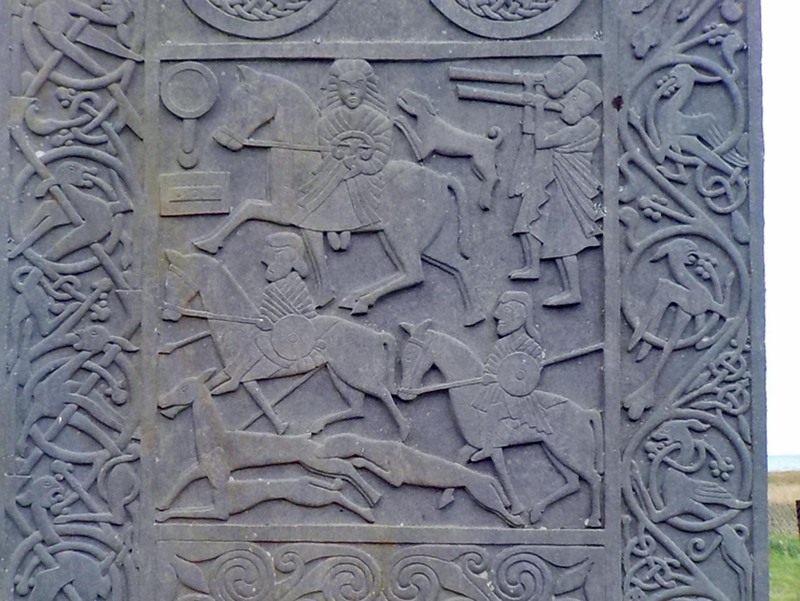 On the HIlton of Cadboll stone is a hunt scene with a woman riding sidesaddle, two men with hunting horns, a stag, dogs, other riders, as well as a mirror and comb to the left of the woman rider. Why these were important images is not known. I leave you with an image of the Tongue-Tied Beast(s). In addition to the stones mentioned, we visited Dunrobin Castle where there are several Pictish stones, but photography is not permitted. This has much less to do with the Pictish imagery than the fact that the stones are housed in a building that is festooned with more than 100 mounted animal trophy heads. I was told that some might find the display offensive–though they aren’t considering taking it down–so they don’t allow photos. Unfortunately, they don’t even have postcards of their Pictish stones available in the gift shop. The castle’s main draw are its fairytale main building and formal gardens. 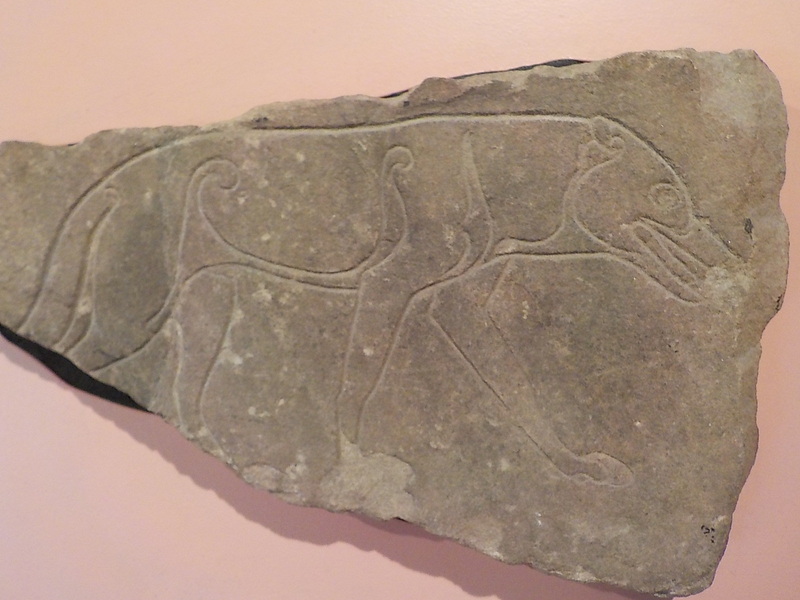 In Inverness, we saw the Ardross Wolf stone (above), and the head of a Pictish beast (below), Still to visit are Portmahomack and Fortrose where there are small collections of Pictish stones to see. We’ve seen all the freestanding outdoor stones in our area that have visible marks on them. There are others all over Scotland from Aberdeen to Iona, but we are visiting stones from Inverness to the west and north. There is an excellent guide to the Pictish Trail in this area. 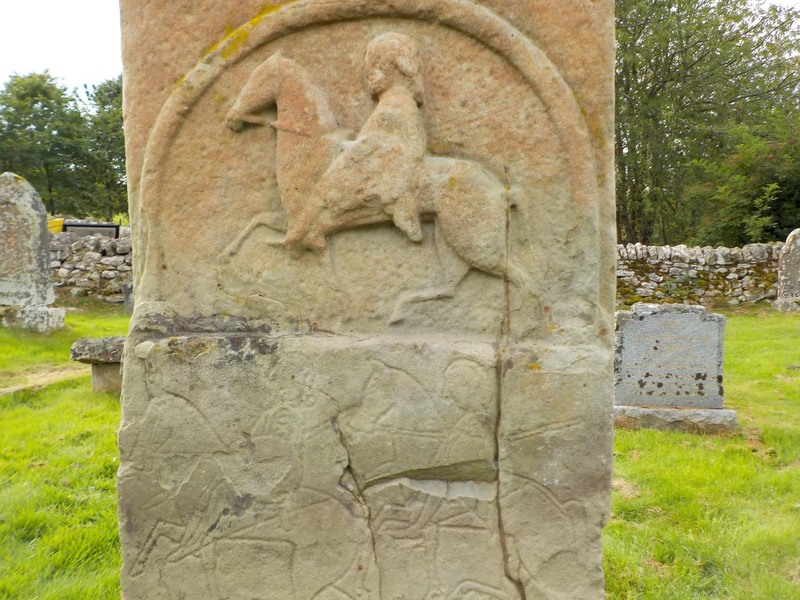 This link takes you to a pdf of “The Highland Pictish Trail: A Guide to Pictish Sculpture from Inverness to Dunrobin” by the Highland Council. Julie, How great to hear from you. I remember your interest in Central Asia, but Ulaanbaatar, wow! I would love to hear about what you are up to. Thanks for getting in touch.